Most of my official trips to Kanpur, the second largest city of Uttar Pradesh and the 12th most populous city of India have been for short durations, with an extremely packed schedule. This has often robbed me of my favourite pastime of walking and exploring the city and indulging in savouring local street food. Thankfully my recent visit this September gave me some time to explore Kanpur. September 5th was the day of immersion of Ganesh idols marking the end of the 10 day long Ganesh Chaturthi festival. I had decided to take a walk along the Mall road from the Bada Chauraha towards Lal Imli Mill in the Civil Lines area of the city. I had barely walked 400 metres when the procession of Ganesh Idols from various pandals across Kanpur stared entering the Sirsaiya Ghat Road besides Z Square Mall. Each procession was a long one, 50-100 people in the least, in unison and festive flare. There was hardly any space on the road to walk and I decided to move towards small shops that lined the road. I stood beside a stationary shop which had a photocopy machine and the owner was busy photocopying textbooks. After a brief while I began conversing with Shukla ji, the shop owner and told him I was amazed to see the sheer number of Ganesh idols. He said “hum Kanpur wale sab tyohar manate hai” (we the people of Kanpur celebrate all festivals). What Shukla ji said next made me realize the lost glory of the city once known as the Manchester of East the centre point of industrial revolution in the country. Shukla ji’s grandfather and father worked in Lal Imli Mill, which dates back to pre-independence era and one was one of the leading textile mill in the region. Kanpur, known as Cawnpore in 1857 was a major centre of revolt as part of India’s first war of independence. The government of the day brought soldiers in large number to quell the revolt and Kanpur developed as a major cantonment. To meet the needs of the soldier, 2 big mills namely Elgin mills and Muir Mills were set up. 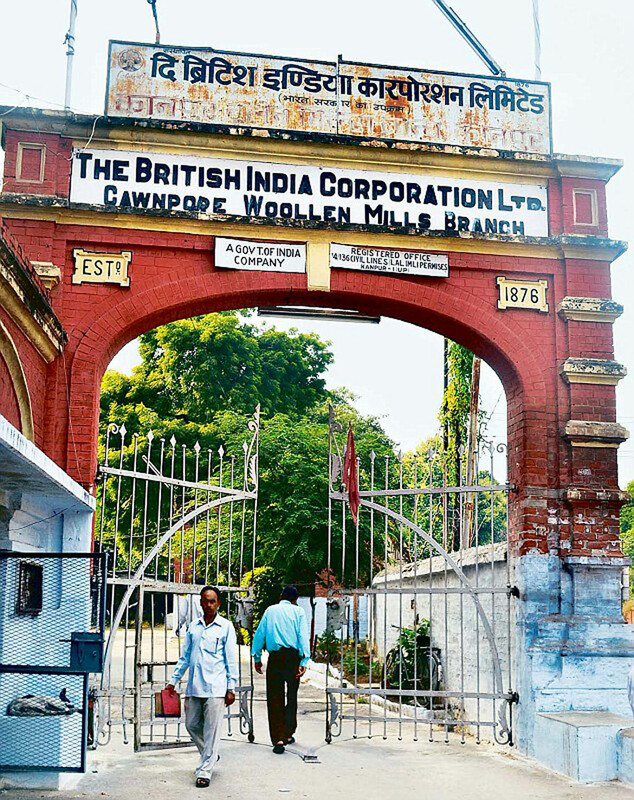 Gradually numerous textile mills came up in the area and Kanpur developed as a major industrial area with the addition of the ordinance factory, engineer and leather industries. Post independence, the industrial sector was not able to sustain itself due to lack of efforts to modernize the infrastructure, poor investment and inadequate supply of raw materials despite efforts of the government to nationalize the textile industries in 1960s and 70s. As business went down, people started losing their jobs. As a result of which, the state and the city faces high unemployment rates according to the NSSO data. We have been working with the leather tanneries in Kanpur for the past few years. Kanpur, with around 700 tanneries (around 400 are operational) is a major producer of leather and leather goods. Almost one-third of India’s leather export goes from Kanpur. Around one-fourth of India’s footwear factories are located in Kanpur and the cluster contributes to 40% of the country’s total footwear exports. The leather industry is often in the news mainly because of the pollution it creates by means of disposing untreated effluents and its impacts on River Ganga. A recent order from the National Green Tribunal has pulled up various central and state government authorities and industries for not addressing the problem. This scenario leading up to the ruling by the tribunal and other negative publicity has led to exports from Kanpur declining by almost 40%. Our efforts and engagement with the tanneries have been towards enhancing the understanding on cleaner production, training and capacity building, driving change by engaging with international buyers to bring awareness and advocacy at national level for promoting sustainability as a growth driver for leather industry. The external environment in the past 2 years has not been conducive for the growth of the leather sector. Our interactions with our stakeholders in the past highlighted apprehensions about their existence, and are worried about the future of the people employed in the tanneries. There is however a silver lining, with the industry realizing that it is in their interest that they move towards adopting environmental safeguards. Some of them have made efforts in this regard and others are eager to take a step forward. We all see the need for the government departments, regulatory authorities, research, academic institutions and civil society to engage together to find solutions to address the current crisis. As we work towards achieving our goals and objectives, it is important to keep in mind that India’s Manchester faces an uphill task to revive its lost glory, and we all have a role to play.